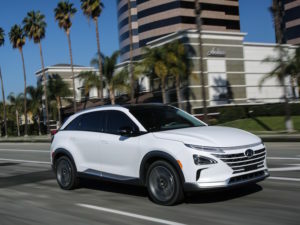 Hyundai has revealed its Nexo fuel cell electric vehicle, which will provide a successor to the ix35 with increased power, range and performance when it goes on sale in select global markets from early this year. The Nexo fuel cell SUV has an estimated range of 500 miles compared with the ix35 Fuel Cell’s 369 miles. Unveiled at the Consumer Electronics Show (CES) in Las Vegas, the Nexo SUV is built on all-new platform designed for fuel cell power and is longer, wider but lower than the ix35. Spearheading Hyundai plans to introduce 18 low-emission models to global markets by 2025, the Nexo offers fuel cell power of 95kW compared to the ix35’s 100kW with a battery up to 40kw from 24kW while the motor increases from 100kW to 120kW. As a result of this, the Nexo brings increased torque of 291lb.ft (221 for the ix35) and a 0-62mph time of 9.5 seconds (12.5 for the ix35). It also brings an estimated NEDC range up 36% to around 500 miles from the ix35’s 369 miles. The Nexo will also provide a platform to debut Hyundai’s forthcoming autonomous technologies as it’s able to provide a stable electric power supply without concerns about driving range. Onboard technologies include a Blind-spot View Monitor system that shows drivers rear and side views from both sides of the vehicle using cameras, helping to eliminate blind spots while changing lanes in either direction. Other technologies include Lane Following Assist, which can keep the steering on the Nexo centred at speeds between 0-90mph on both highways and city streets and can be used with Hyundai’s Highway Driving Assist, which adjusts speed in line with prevailing limits. The Nexo also introduces a Remote Smart Parking Assist that can enter or exit a parking space without the driver needing to be on board.